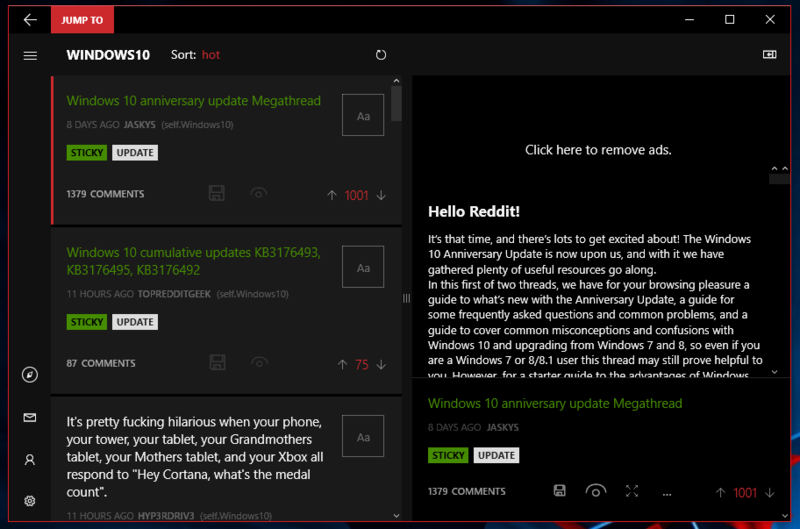 Readit UWP app for Windows 10 gets new update version 5.6.4.0. With new subreddit notification, users get directed to the specific subreddit. The update mostly includes bug fixes and improvements. Subreddit notifications will now take you to the subreddit and the specific post for viewing. Fixed a bug where caching would cache the license even if you haven’t purchased Readit ad-removal causing your license to never be checked again even if you purchased ad removal. There is no longer a bar above posts in profiles, inbox, and search in the mobile UI. Fixed bug where nsfw subreddits would show an overlay on every post in swipe view. Fixed graphical issue when pressing and holding on a post, you must now release your finger now for the context menu to appear though. Fixed a bug where brackets could cause plain text to be interpreted as a link in markdown. Fixed gifs sometimes playing in the post list which caused the app to slowdown (anniversary update). Fixed buggy submit button that attached to the keyboard (appbar) in mobile UI. Fixed unsubscribe not working in the subscriptions list.